Pibbs PS74B Granito turbo jet pedi spa features: The chair swivels from side-to-side for easy client access, with adjustable reclining chair back, 6 mode vibration and heat massage. Features a handheld remote control for your clients comfort. A pipe-free jet system with removable jets that are easy to clean. The Black basin has a sleek european design, a unique overflow drainage system, flexible stainless steel spray hose and Led light. The base is made of fiberglass-reinforced acrylic for extreme durability. 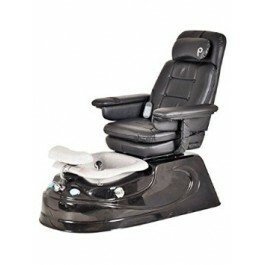 The spa bowl and footrest are 100% hygienic & non-porous. The Granito Spa top is comes in black . The Grey Pearl Base is fiberglass-reinforced acrylic.